John Millman says he will be able to resume training in the next few days as planned after taking two injections to calm a back injury that terminated his tennis season early. 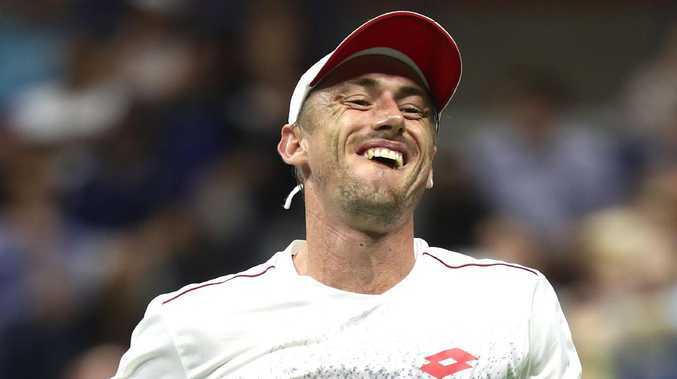 Millman said he had no doubts he would be able to put together a pre-season allowing him to present well at the Brisbane International, which is played in seven weeks to start his 2019 season. The Australian No. 2 has had trouble with hip and back injuries since his US Open quarter-final run in early September. Millman then retired in the second set of his first match at the Paris Masters earlier this month with back pain. "I had what's caused a medial block branch in my lower back to settle the inflammation. I've had the same injections as I had before, so it's nothing really concerning,'' said Millman, who has returned to Brisbane. "It just helps the recovery process. "The hip is feeling great. There was inflammation there and the usual wear and tear of an ageing body. "I am on holiday now while doing a few little things to make sure I can hit the ground running in the pre-season, which will start by early next week in the gym. I'm happy with the plan and really excited to kick things off in Brisbane. Millman will finish the year ranked in the mid-forties from his current No. 34 spot when points won in late 2017 in Asian Challenger events fall off his 52-week rolling tally. The Queenslander will not have a top-eight seeding at the Brisbane International, which starts on December 31, or a top-32 seeding the Australian Open in January. "The logical next step is getting a seed at a Grand Slam,'' Millman said. "I've always had belief in my game. I'm more confident at this level and the thing is to avoid big injuries because tennis becomes realty trough when that happens.